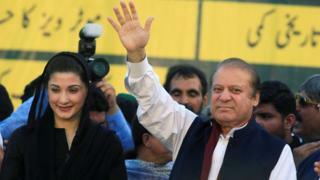 Pakistan's former Prime Minister Nawaz Sharif has been granted bail for six weeks to receive medical treatment. Sharif is serving a seven-year term imposed last year for investments beyond his declared assets. He denies any wrongdoing and has appealed. The 69-year-old reportedly has a heart condition and kidney problems. The Supreme Court says he will not be allowed to leave the country and needs to surrender to prison authorities at the end of the bail term. Sharif's lawyers claimed that he needed urgent medical attention that could not be provided in jail. Chief Justice Asif Saeed Khosa says if he does not surrender voluntarily he faces being arrested. A bail appeal last month was rejected by the High Court because they said that reports of his condition did not "suggest that continued incarceration... in any way, would be detrimental to his life". Sharif was prime minister from 1990 to 1993, and again from 1997 until a bloodless coup in 1999. He was then elected for a third term in 2013, which was marred by upheavals and corruption allegations. The Supreme Court removed him from office in July 2017, claiming he had failed to disclose part of a salary drawn from his son's company. He was then convicted in two other separate corruption cases for not disclosing sources of income. Sharif denies any wrongdoing and claims the charges are politically motivated. The first of those related to the ownership of high-end properties in London. He was convicted in July 2018 but in September he was granted bail. His 10-year sentence was suspended until the final decision on his appeal. But in December, in the second case, he was jailed for seven years and fined $25m (£19m). The anti-corruption court in Islamabad had said he was unable to show where he obtained the money he used to buy the Al-Azizia steel mill in Saudi Arabia. Sharif has appealed against both convictions, accusing the military and the courts of conspiring to end his political career and destabilise his Pakistan Muslim League-Nawaz (PML-N) party. The appeals process in both cases is ongoing.